When I took a Pastry Class at the San Francisco Baking Institute we learned how to make Blitz Puff Pastry, also known as Quick or Rough Puff. This puff pastry is easier to make then the classic (traditional) puff pastry, yet I found the results are very similar. Once you master the technique of Puff Pastry, there are so many things you can make with it, both sweet and savory. 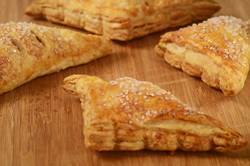 One delicious idea is these Apple Turnovers. Triangles of puff pastry are wrapped around cinnamon laced chunks of apple. My preference is to use Homemade Blitz Puff Pastry to make these turnovers. And there is a recipe and video on the site on how to make it. However, you can use store bought. If buying the frozen puff pastry that comes in a 17 ounce (482 grams) box containing two sheets of frozen puff, simply defrost one sheet of the puff pastry overnight in the refrigerator. Also, this recipe makes 6 Apple Turnovers but you could double the recipe if you want to make 12 Apple Turnovers. If you're using Homemade Puff Pastry you can freeze the unbaked Turnovers. Once assembled, place the unbaked Turnovers on a parchment paper lined baking sheet in a single layer. Freeze. Then place the turnovers in an airtight container or freezer bag. You can bake the Turnovers frozen, they will just take a few minutes longer to bake. Apple Filling: Peel, core, and cut the apples into 1/2 inch (.5 cm) chunks. Place in a saucepan, along with the water, sugar, and ground cinnamon. Stirring occasionally, cook over medium heat, until the apples are tender (but not mushy) when pierced with a sharp knife. (This will take about 10 minutes.) Remove from heat, transfer to a bowl, cover, and place in the refrigerator until the apple filling has chilled (about one hour). You can make the apple filling a day ahead. Puff Pastry: On a lightly floured surface, roll the puff pastry into a rectangle that is slightly larger than 9 x 13.5 inches (23 x 34.5 cm). With a sharp knife or pizza wheel, trim the four edges of the puff pastry. Next, divide the pastry into 6 - 4.5 inch (11 cm) squares. Place the squares of puff pastry on a parchment lined baking sheet. Cover with plastic wrap and place in the refrigerator to chill until firm (about 15-30 minutes). Apple Turnovers: Working with one square of puff pastry at a time, brush the edges of the pastry with egg wash. Place about 1 tablespoon of the apple filling in the center of the pastry. Take one corner of the pastry and fold it diagonally over the apple filling to form a triangle. Press the edges together to seal the pastry. Then with a bamboo skewer make a decorative edge by pressing the pastry inwards between two fingers (see video). Place on a parchment lined baking sheet. Repeat with the remaining squares of puff pastry. Then brush the tops of the apple turnovers with egg wash and sprinkle with sugar (if desired). Cut two small slits in the pastry. Cover and place in the refrigerator while you Preheat your oven to 400 degress F (200 degrees C). Place the apple turnovers in the oven. Immediately reduce your oven temperature to 350 degrees F (180 degrees C) if using a convection oven. Or reduce the oven temperature to 375 degrees F (190 degrees C) if using a regular oven. Bake for about 35-40 minutes or until golden brown. Remove from oven and place on a wire rack to cool. Note: The unbaked apple turnovers can be frozen. Place the turnovers in a single layer on a baking sheet and freeze until frozen. Then transfer to a freezer bag or airtight container and freeze for up to two months. The turnovers can be baked directly from the freezer. They will take a few minutes longer to bake.